Bernhard Grzimek (1909 – 1987) was a renowned Silesian-German zoo director, zoologist, book author, editor, and animal conservationist in post-war Germany. He was the Director of the Frankfurt Zoological Garden for almost 30 years, and the president of the Frankfurt Zoological Society for over 40 years. The society – organised on similar principles as its London and New York counterparts – runs a number of wildlife conservation projects both in Germany and overseas; most well known is its ongoing work in the Serengeti ecosystem in Tanzania. We boarded a light aircraft and flew the 85 miles to Rubondo. Achard knew what he was doing when he chose Rubondo. I immediately fell in love with the island. It is 24 miles long and on average, 5 miles wide. Three-quarters of its 135 square miles are covered with forest and the remainder consists of grass-covered hills. Above all, Rubondo is uninhabited. When the ship finally reached Tanzania, he was bemused to note: “The first Dar es Salaam paper I opened when I reached Mwanza contained a photograph of the chimpanzees accompanied by a ridiculous report alleging that the animals, which hailed from European zoos, were accustomed to nothing but the best Russian tea. It appeared that the chief problem would be how to convert them to drinking plain water in the wild. I don’t know which sailor sold this nonsense to the African reporter in Dar, but the same picture and report were reprinted in every German newspaper.”! Sinclair Dunnet is seen in the picture below, opening the crate with great care. 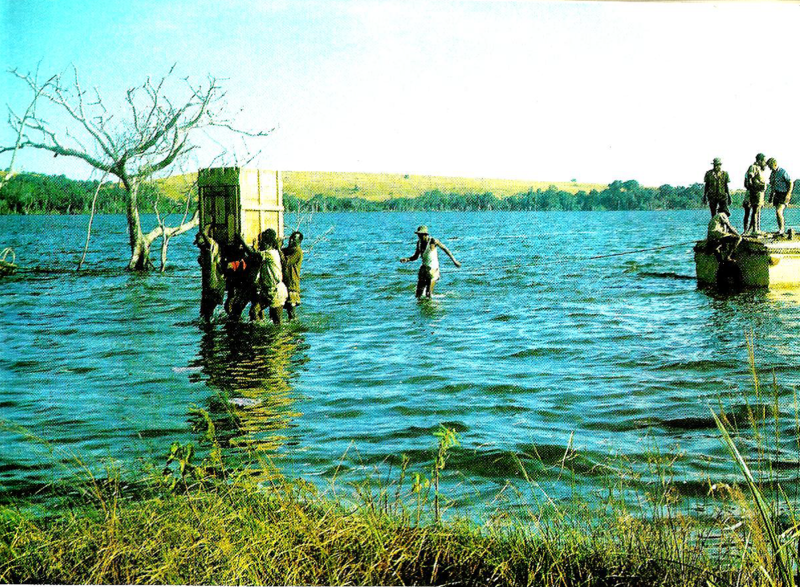 “He could retreat into the water at a moments notice because anthropoid apes are non-swimmers.” In Uganda, on the opposite shore to Rubondo, he had a great idea to assist the game wardens in combating water-borne poachers. Having heard of a German firm manufacturing the Amphicar (an amphibious car capable of travelling on land and water), he ordered one and had it shipped to Mombasa, where he met it and drove to Uganda, always followed by a crowd of curious onlookers! 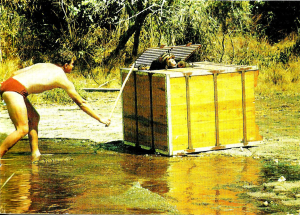 He used the open-topped convertible with great success as a game-drive vehicle in the game reserves, both in and out of the water. 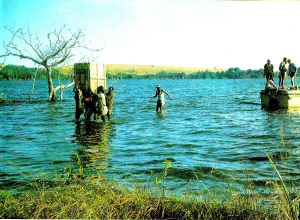 “I could have sold my amphibious car three times over to enthusiastic American tourists, probably at a premium, but I and Aubrey Buxton had already made a joint present of it to the Uganda National Parks. It is hoped that their new African director, Francis Katete will put paid to [get rid of] the poachers with its assistance.” In an effort to learn more about the behaviour of large African animals, he convinced a German company to make up life-sized inflatable models of a lion, an elephant and a rhino, which he planned to set out strategically to observe the real animals’ reactions to them. The lion was quickly deflated by the claws of a curious lioness in the Ngorongoro Crater, and Ian Douglas-Hamilton, the famed elephant researcher, assisted him in placing their dummy in the vicinity of wild elephants, often demonstrating considerable bravery, according to Grzimek. 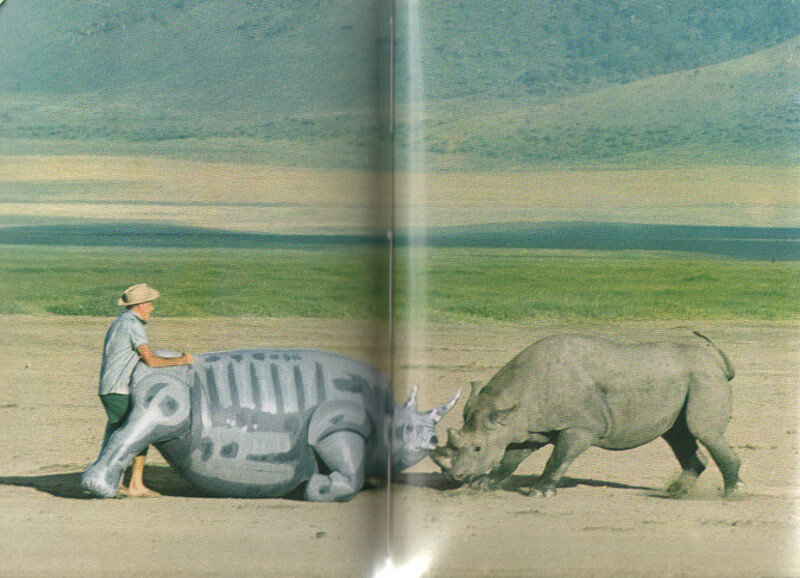 Thus, when the time came to experiment with the inflatable rhino, Grzimek felt he had to demonstrate some bravado of his own, which resulted in the picture below. “I found it a rather uneasy sensation, confronting an aggressive bull rhino with nothing but a balloonful of air between his horns and my ribs. It soon turned out that the rhino felt almost as uneasy as I did.” It is doubtful that anybody would repeat this experiment in the present day, but in those early years of studying the wildlife of East Africa, it seemed a sensible method in the very early days of the science which has now become known as ethology. Bernhard Grzimek’s stories are peppered with adventures and the occasional mishap, filled with great humour, and like the naturalist David Attenborough, he was imbued with a huge love of the animals, and a powerful desire to protect and preserve the wild places and landscapes of Africa. Find out more about the Frankfurt Zoological Society on their website.